I’m chatting to Ally MacLeod, the Hibernian cult hero, when who should happen by but his old Hearts foe Jim Jefferies. They exchange warm greetings, check on the wellbeing of mutual friends and promise to try to win a few quid from each other in a game of golf before they get much older. Then the conversation drifts to today’s big match. “I’ve a wee feeling Hibs might do it,” says Jefferies. “I was talking to Sloop the other day and he thinks so, too, as does Billy.” The latter is Billy Brown, Jefferies’ No 2 in management for many years who was in the Hibs dugout when they lost the 2012 final. Sloop is John Blackley, one of the beaten Hibees in the final of 1972. MacLeod gives his vote for the men in green, too, which seems like a helluva lot of backing for a club with a gargantuan disinclination towards the world’s oldest national trophy and this may spook those fans of a nervous disposition, which basically means all of them. But Ally qualifies his approval of the current team. Ninety-nine in seven-and-a-half seasons at Easter Road and, reflecting on that goal haul, the faithful know the exact moment they would have wanted him to make it 100. The time was fast approaching 10pm on 28 May, 1979, the date of the third attempt to settle the War and Peace of Scottish Cup finals between Eddie Turnbull’s Hibs and Rangers. 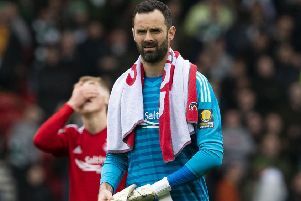 MacLeod, cool as a cucumber – and there weren’t many of those around with summer being delayed by this great saga – had stroked home a 78th minute penalty to signal another bout of extra-time. “I remember picking up the ball and going round Sandy Jardine and Colin Jackson,” he says, as if this was the easiest thing in the world, which, if you possessed MacLeod’s languorous talents, it probably was. “I hit my shot and thought it was in. Peter McCloy was beaten. But the ball struck a post and bounced away. The score was 2-2. A goal for us at that stage would probably have won it.” The Scotsman declared this “terrible luck” and then a Hibs man did strike but it was Arthur Duncan at the wrong end. The longest final there will ever be was over at last, but three days later came a sado-masochistic twist in the shape of a re-arranged league game. “Christ, I’d forgotten about that!” groans MacLeod. “Wasn’t the crowd at Easter Road really small?” 3,242 – surely an all-time low for this often incendiary fixture. “I think our fans were sick of the sight of Rangers and we certainly were. I’ve always wondered: what if poor old Arthur hadn’t scored an og with that amazing diving header – would there have been a third replay? The final seemed like it was never going to end. We meet in Edinburgh’s Marriott Hotel on the western outskirts, just across the road from the Maybury roundabout, where open-top buses have often been pre-booked in pencil for a Hibernian winners’ parade, only to have to be stood down. MacLeod is 65 and looks well on having sold off half his finance business, allowing more time for golf in the Algarve and trips to London with his wife Rona to catch up with their grand-daughters. He’s always had a good head for figures but one stat doesn’t add up: those 114 cup-less years for Hibs. “You do need a bit of luck to win it,” he agrees. “We didn’t have much in 1979 and neither did Hibs last week against Falkirk [in the Premiership play-offs].” The most telling, if not damning, stat concerning the 2012 finalists from Leith, thumped 5-1 by Hearts, was that half the side were loanees; MacLeod couldn’t see how they were going to succeed with such a line-up. But, those earlier reservations apart, he likes this team and their manager, Alan Stubbs, and hopes he stays. Maybe, apart from his goals from the middle, this lot could do with some of MacLeod’s fierce self-belief. It was a trait which was sometimes misinterpreted, such as when Jim McLean signed him for Dundee United at the start of what would be the Arabs’ greatest season. “He said to me: ‘Now listen, you can’t strut about up here. I don’t want any of your arrogance.’ I didn’t know what he meant.” Unfortunately an injury picked up on a coaching course was to prevent MacLeod playing any part in United’s 1982-83 Premier League triumph. He makes for a fascinating subject. Dissenters thought he was lazy, that he couldn’t run, that he often looked disinterested – and they wondered why he never smiled. Well, he has a good old chuckle today at the number of times in my yellowing match-reports he’s described as “enigmatic”. MacLeod appealed to the aesthetes, men like my father. Dad led a thoroughly cultural life and football only rated a mention in his diary when his favourite footballer did something special. I used to sneak a peak hoping to see mentions of the “Ally Shuffle”. The late, great Ian Wood, former sports editor of this paper, was another devotee, though he once remarked that MacLeod “gave the impression he’d as soon be at the pictures as hanging about a draughty football pitch”. MacLeod’s footballing life began in the playground of Ibrox Primary School, just across the road from the stadium. His father was a marine engineer, his mother, if she were still alive, would be insisting I address him as Alisdair, though his birth certificate actually reads Alexander Hector McMillan MacLeod. He supported Rangers in boyhood and, he says, “every other week I was told they were about to sign me”. For more than 40 years now, he’s called himself a Hibee. He was brainy enough to go university and contemplated it before joining the Bank of Scotland. “My so-called glittering career,” he laughs. “By now I could be reviled!” A banker through the week, he turned into a Buddy at weekends, trying to keep first club St Mirren in the old First Division in 1970-71 and scoring both goals in a 2-2 draw with champions-elect Celtic at a sell-out Love Street, but it wasn’t enough. As we know now, Hibs didn’t win the title that season, finishing third after two second places previously. Turnbull tried to convince his re-modelled team they were the equal of the Old Firm: “He always told us he wouldn’t swap one of them for one of us.” MacLeod developed the happy knack of scoring against Hearts, including an especially explosive derby when the same Jim Jefferies was one of two Jambos sent off. He netted in nine consecutive matches, an achievement which wouldn’t be beaten until Rangers’ Marco Negri came along. But, as we also know now, MacLeod’s Hibs didn’t win the Scottish Cup either, and, indeed, after coming so close in the 330-minute final, they were relegated. Unlike so many who’re demoted now, he didn’t jump ship. “The attitude of that team was: ‘We took the club down, let’s get them back up.’” There’s a lot MacLeod doesn’t like about modern football, not least that so many players seem “ungrateful”. He repeats: he loved being a footballer, even if it never looked that way. “When I was forced to stop playing it took me five years to get over not being part of a dressing-room anymore.” And he’s happy to still be here to talk about the game. Best, you think, would have appreciated what turned out to be MacLeod’s last but one goal for Hibs, with Dundee once again the victims, as he banged a free-kick into the left-hand corner of the net, only to be ordered to re-take it. Unflustered, deadpan but definitely not grumpy, he simply popped the ball into the other side.